I grabbed a coworker and asked for a random number between 1 and 154. I’ve taken the final couplet from the sonnet she chose (she didn’t know she was picking a sonnet), and provided the modern translation below. Tell me which sonnet this is. Entries accepted via comments on this blog post, or on Facebook. PLEASE NOTE THAT I WILL NEED TO CONTACT YOU TO GET YOUR ADDRESS IF YOU WIN. Winner will be chosen randomly from the correct entries. Do not post spoilers (i.e. 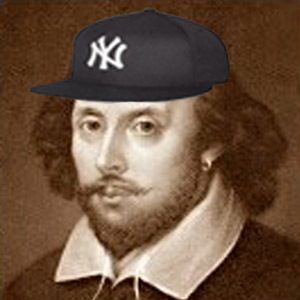 copying the text of the actual sonnet if you think you got it right), that will invalidate your entry and I’ll almost certainly remove those comments. Contest runs until end of day on Friday, November 30. Like I said, short one. I want to try and turn it around quickly. Everybody ready? Here you go! Your eyes will spot my love that’s yours to take. Just tell me what sonnet that’s from, and make sure that I’ll be able to contact you if you win, and do it all before Saturday. Good luck! 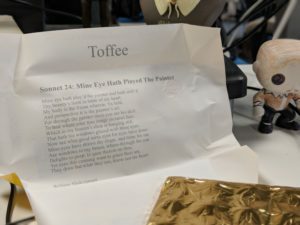 I’ve written about how last week not one but two separate coworkers sought me out to tell me about a Shakespeare-branded beer (“ShakesBeer“). We’re still on the hunt for that one. 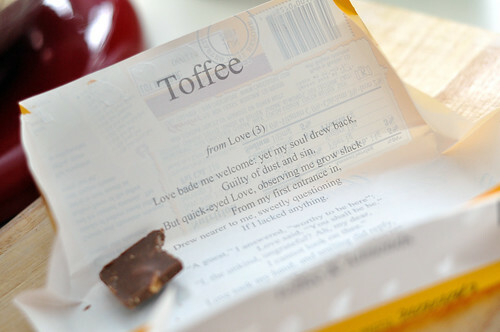 While waiting for his wife to get back to him I decide to throw the question out to the Twitterverse, noting that “some sort of Shakespeare quote on it” actually meant “a sonnet inside the wrapper” which is even cooler. I’m crushed. 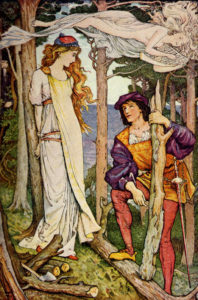 “That’s not Shakespeare,” I tell him after reading about four words. “I guess each one has a different poem,” he tells me. Well, now the hunt is on. Their website has a “find a location” section and sure enough, it’s exactly what I suspected originally – straight to Whole Foods for me! They actually have at least half a dozen flavors, but most of them were dark chocolate and I’m not as much of a fan. But I’m probably going to make multiple trips, who am I kidding. I swear I felt like the kid in Willie Wonka and the Chocolate Factory, peeling open the wrapper slowly to unveil the golden ticket inside. But did I get a Shakespeare or not?! The suspense! I did! Sonnet 24, to be precise. And yes, I have a shrine of Shakespeare action figures and bobble heads on my desk at work. Doesn’t everybody? P.S. 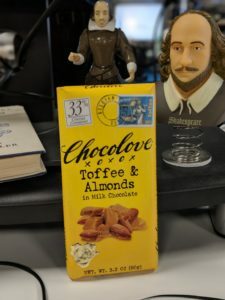 – Last week beer, this week chocolate. I can’t tell if the universe loves me or is trying to kill me. Either way I’m ok with it, I’m going down happy. P.P.S – Also! These are apparently part of the Whole Foods / Amazon Prime program, if that’s available in your area. So if you’ve done whatever soul selling thing you do to let Whole Foods know you’re a Prime member, you can get them at a significant discount. In my neck of the woods it was $3.19 for a single bar but would have been $4.00 for 2 bars if I had my accounts linked. So a funny thing happened on the way to the Folger Library this week. As you may have seen on other social media channels, my family and I are in Washington D.C. for a couple of days and were lucky enough to visit the Folger Library again, having been there six years ago. I knew that even if we did not manage to arrange a tour, I could at least take the kids back to get some pictures outside. They were pretty young at the time and I’m not sure what they remember. So I was quite surprised when we were cruising through the various museums of the Smithsonian and in one of the gift shops my middle daughter said, “Nope, I’m saving my souvenir for Folger, I know exactly what I want.” I assumed that she just wanted a Shakespeare something, and hinted strongly to her that we have a lot of Shakespeare somethings already. Turns out she actually remembers seeing a book in the gift shop the first time we were there. Apparently, and I do slightly remember this, I told her that the book was too old for her. Well, it’s six years later and she’s making a beeline for that book. Only problem? Folger Library gift shop is closed on Monday. The cunning livery of hell.